Side story: K-On!! : Ura-On! !, K-On! Movie, K-On!! : Keikaku! Over the few years or so, it’s been increasingly apparent that watching anything associated with moe is to be treated with the same sort of caution as doing yoga, or making origami. Generally you’d do all three in the privacy of your own room, preferably with the lights dimed down and curtains tightly shut. (I am speaking of course, mainly for guys). Yes there is much shame to be had in admitting you enjoy watching K-On! !, because who in their right mind would enjoy a plotless moeblob slice-of-life show over say… the testosterone filled battle epic TTGL? Certainly no one would admit to such an atrocious act to their friends face to face, (or anything less than a distance of 100 miles and 2 computer screens for that matter). Hence it becomes extremely hard to be objective when posed with the question, ‘Is K-On!! a good anime?’, because all of our social preservation instincts scream “run away!”, while somewhere deep in the soft side of our hearts, something keeps us rooted to our chair and our eyes on our displays. Jokes aside though, in recent times I feel that too much anime are being categorized based on if they have any moe elements in them. While there’s nothing wrong with giving labeling an anime as containing moe, it unfairly depicts certain anime as catering towards the niche otaku audience and suggests it’s lack of depth and unoriginality, which in many cases simply isn’t true. Take Lucky Star for example. Who’s to say that it was just a mindless moeblob? Anyway I had a review here somewhere… I would go as far as to say that I love the slice-of-life genre. Honey & Clover (which I maintain is more slice-of-life than romance) and Aria remain firmly at my number 1 and 2 spot. For a great slice-of-life, there are a number of criteria that one needs to fill, but the simplest and most important is that every episode should end with you feeling relaxed and contented with a smile on your face. Does K-On!! achieve this? Yes, absolutely 100% yes. K-On!! follows a relatively frugal format in terms of storyline. You wouldn’t go into each episode expecting anything dramatic or exhilarating, and for some this may be what they like to call boring. But then again, you wouldn’t open a bag of chips expecting M&Ms and chocolate fudge, so why you go into K-On!! expecting anything even resembling a continuous plot? K-On! !’s style single episodic scenarios work greatly in it’s favor, viewers are never startled with annoying cliffhangers or feel an obligation to keep up with it in fear of missing out on some important plot element. If watching K-On!! becomes a chore (I’m looking at you Bleach manga), then it’s missed the point completely, and in this regard, I give K-On! !’s ‘plot’ two thumbs up. Despite this though, K-On!! deals with some surprisingly deep themes that would go right over the heads of most casual viewers. One definite improvement from it’s first season is the branching out of the limited focus of club practice (eating cake) to wider array of activities. Granted, most of them are still obvious and predictable, the sort of been-there done-that stories we’ve all seen before, but the shift allowed K-On!! to focus on many different aspects and resort less to what I like to call ‘moe-moments’ in order to fill up the 24 minutes. Lets face it, how many different ways can you eat, drink and procrastinate before it starts getting old? Instead though, from the summer trips to school plays to the air conditioning campaigns, K-On!! moves away from the same-ness of cake/tea/practice/more cake in the first season and closer to true slice-of-life. K-On! !’s real brilliance shines in the final 6-7 episodes or so, as the girls neared the finale of their school life, the realization that their after school tea times can’t last forever hits them quietly and their are faced with the challenges of change and the future. Though not exactly compelling and dramatic, it nevertheless teaches us that our beloved peaceful times cannot always last forever, which only makes them more precious, not unlike Aria the Origination, but on a smaller scale. 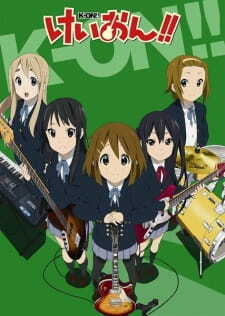 K-On!’s main idea was a carefree life of daily cake, tea and music with not a worry in the world, but K-On! !’s step away from that ultimately paid off and turned what would have been just a mediocre moeblob into a great slice-of-life. I supposed I’d better tackle the moe problem, as it seems to be the main issue dragging K-On!! down. Yes, there is a lot of it. Yes, it gets annoying. Yes, it is overused and detracts from the overall effect. Would K-On!! be better without it? Probably. But then it wouldn’t be K-On!!. Yes you can all come and egg my house afterwards for using such a cliche argument, but there is some wisdom in my words, ladies and gentlemen. As much as we all hate to admit it, moe has become an integral part of the characterization of the K-On!! girls. Yui simply wouldn’t believe the same if she didn’t drool over Azu-nyan or cake, Azu-nyan wouldn’t be the same if she didn’t get embarrassed over every little thing and Mugi simply can’t exist without her air-headed-ness and cheerfulness. Sure, they could do without it, but then they’d be different characters completely. Big Macs would probably taste better with tomato sauce instead of mayo, but then they wouldn’t be Big Macs anymore, if you get what I mean. Even though I make better tasting burgers myself, I wouldn’t want to have Big Macs any other way. And to be fair, a lot of the moe-hate stem from people who watch 3-4 episodes, drop it, and then go complain about it on forums. As I followed K-On!! throughout it’s season, I was quietly surprised as the moe-moments gradually thinned out little by little. It was as if as the girls grew older, the show slowly matured along with them. Don’t believe me? Well, don’t my word for it, see for yourself. Right now. Open up say episode 2 or 3, count how many moe-moments there are, and then compare them to a later episode, say, 21 or something. Don’t worry, I’m not going anywhere so take your time… Ok… done? See? Good. Anyway as I was saying, the gradual fade of moe was was subtle and barely noticeable, but for those paying attention it was a nice touch, and went along well with the tone of bittersweetness of the end of their high school lives. Guess I better get on to the boring stuff now. Animation: Nothing to write home about, but the smoothness and crispness is certainly pleasing and relaxing to look at, a very good style for a slice-of-life. Animation during the live performances have definitely improved since the first season, which is a definite plus. Sound: Insert songs aside, more often than not there’s always some cutesy background music playing to accompany the scene. While this can easily backfire, KyoAni does a very good job of timing, and fitting the mood with the right music, so this section is also a plus. Voice Acting: I was surprised in the first season how such a amateurish band of seiyuu could bring the characters to life. Another season’s gone by and I’m pleased that the quality of VA as remained consistent. Toyosaki Aki’s performance as Yui deserves a special mention, with interchanging voices between cutesy and hoarse, and the constant (if a bit too frequent) “ehhh?”s, it was really a joy to listen to. I still maintain that she needs singing lessons though. So ultimately, is K-On!! a good anime? Well let me be perfectly honest. I actually wrote this review as a bet against a friend who maintained that it was impossible to write a review for, and I quote, “a cliched intangible blob of moe”. Now to be fair, he may have been right. Maybe I would have found it much easier to just simply cast K-On!! aside as a generic moe-cash in by KyoAni with half decent characterization, no good plot and overall mediocre anime. But as I instead set out to do the impossible task, I was pleasantly surprised when I realized that it was not as impossible as I originally thought. K-On!! is good. Heck, it’s great. It knew exactly what it wanted to be, and set out to achieve it brilliantly (which is more than I can say for Angel Beats). I’d probably go as far as to say it is the best slice-of-life/moe anime of the year. Sure, it probably couldn’t hold a candle to say… Durarara or FMA:Brotherhood, but you wouldn’t compare K-On!! to those anime for the same reason you wouldn’t ride a goat to an equestrian event or wear a miniskirt to a basketball game. Is K-On!! a good slice-of-life/moe? Yes. Then… did I enjoy K-On!!? Yes, immensely. Then… Is K-On!! a good anime? Obvious answer is obvious. So much for generic and mediocrity huh? I will conclude with this afterthought. I could probably very easily write a long rant about the negatives of vanilla ice cream. I could talk about how bad it is for your health, how expensive and nutrition lacking ice-cream is, or how it is an overrated flavor and too many people eat just because they don’t have the guts to try new and better flavors, or how the ice-cream companies continue to make vanilla ice-cream to cater for those idiotic people, cashing in instead of nobly taking the first step in revolutionizing ice cream flavors. But at the end of the day, it doesn’t change the fact that I like vanilla ice-cream, and that I enjoy having it every Friday night after dinner as I tune in to watch the weekly action flick on television. If I didn’t enjoy vanilla ice-cream, would that change the fact that it’s a good ice-cream? Of course not. You’d be a magnificent retard for declaring vanilla ice-cream is bad just because you don’t like it, so why do some people do it so much for anime like K-On!!? Vanilla ice-cream exists for people who like vanilla ice-cream, just like K-On!! exists for people who like a good slice-of-life with a bit of (or quite a bit of, whatever floats your boat) moe. If there are people who enjoy it, then that should be all that matters, and I think sometimes we’re too easily forgetful of that fact. Thanks for reading this wall of text. Things are sometimes more than they seem. For any individual, there always are surprises to be found in the long walk of life. Things that initially appear flavorless and dull, but reveal themselves to be something much more colorful. These are the kinds of experiences that impact a person and make them feel something of significance. They may make them laugh or cry, but in the end these are the kinds of stories that hold a special place in one's heart. The second season of K-ON is, for me (and for many), this very experience. K-ON has always been a very polarizing series, one which has a dedicated fanbase and a vocal group of people staunchly asserting their hatred of the anime. Regardless of any personal feelings one might hold towards the massive franchise, it's impossible to deny the influence that it's enjoyed these past few years. But unlike so many titles that are successful simply by chance or for manipulating its viewers, KyoAni has painstakingly focused on quality to ensure that K-ON deserves every bit of its fame. Clearly, this is not a complex story. This will not challenge your beliefs or ideals, nor give you something to analyze and mull over. It's first and foremost a character-based slice of life revolving around five young girls and their daily lives within their highschool music club. Though reluctant fans and critics of the genre may find themselves irritated by the idealized and cute nature of the series, there is much more value to be found than a cursory glance at the artwork or synopsis might suggest. K-ON is an anime which all groups of people can enjoy- provided that the notion of 'cute girls drinking tea' doesn't make you want to go outside and blow stuff up. While comedy plays the most extensive role in the entertainment of this series, a good portion of the fun comes from the characters and their basic interaction with each other. There's a very interesting dynamic between the main cast and they contrast and play off each other in both comedic and dramatic scenes. The most noteworthy example of this is the relationship between Yui and Azusa: a lazy, ditzy girl alongside her extremely hardworking and strict junior. While there isn't anything especially unique or complex to be found at first, it's a relationship that eventually develops into one that feels genuinely endearing. There are no melodramatic arguments between the two, nor is there only a single moment where their feelings come to light. Surprisingly, the resulting character development does not subvert this dynamic but instead expands upon it. Azusa still finds herself feeling out-of-place and anxious in regards to the silly behavior of her seniors, while Yui also struggles to take her musicianship more seriously and come across as a figure that Azusa can rely on. A heavy contrast between the two exists as a result, which allows them to gain insight and grow from each other in a way that feels meaningful, while still retaining the inherent nature of their personalities. It's a dynamic that the series focuses on and highlights, and thankfully this aspect is treated with the care that it truly deserves. Of course, K-ON focuses heavily on the other members of the club as well – five girls of very different lifestyles and backgrounds coming together and becoming close and inseparable friends. Unlike many slice of life series, this isn't an immediate growth between the cast (sans the long friendship between Ritsu and Mio), but rather a gradual one that builds from each episode. Rather than focus on one specific character each episode, the series is often focused more on their time together as a group. The girls all feel like human beings with personality and purpose, rather than the faceless archetypes that have become a staple of many anime titles. As a result, it becomes very easy to grow attached to the characters and feel like you're along with them for the ride, rather than simply being a mere spectator. For an anime to immerse its viewers to such a level – to allow them to feel like they are there with the cast, is a very special thing. It serves not only to make each moment more meaningful, but to make the experience feel very personal as well. When the tale of the five girls is over, you may find yourself feeling like something important inside of you is now missing. If all the tea and cake leaves you in doubt, this will be the sign of something more. The most prevalent theme within the series is that of growing up. They change, they adapt, and they learn to accept their new situation. As graduation draws closer for four of the five girls they deal with the complications of college entrance exams, career choices, and leaving their highschool life behind. Surprisingly, this has the biggest impact not on these characters themselves, but on their junior, Azusa, who feels discontent and uneasy about her friends moving on before her. She struggles with the prospect of managing the club by herself and recruiting new members for after the other girls graduate, an issue that is touched upon many times and eventually resolved towards the end of the series. It's this theme which leads to a wide variety of emotional and heartwarming moments in the story. Two preeminent examples include the girls performing in front of the school for a final time and having a tearful realization after, and a final scene where the four girls graduate and play a bittersweet farewell song in the club room for a crying Azusa. I am not ashamed to admit that these two scenes made me tear up. Which brings up an interesting point, because if the series were so focused on the girls eating cake and doing nothing each episode, would these kinds of scenes exist in the first place? No. It almost feels like a direct contradiction to the claims of the anime being focused on nothing more than the cuteness of the characters, and while it's impossible to deny its presence in the story, it's quite clear that this is not what the anime is defined by. This is what sets K-ON apart from many of its competitors: being an anime that is not only cute and entertaining, but one that carries emotional impact as well. It should also be noted that while the manga is not by any means bad, KyoAni took Kakifly’s very simplistic 4-koma and added an enormous amount of detail to it, taking important plot elements that only existed in a passing line or panel from the manga. The vast majority of the character development and emotional scenes are the work of KyoAni and the talented staff behind the anime, and for taking liberties and improving upon the manga in so many ways they deserve to be applauded and commended. There's an adage about how adaptations are always inferior to the source material, but this is one example that proves it's not always so. But then, where would the series be without the stunning production values that KyoAni is so well known for? This is luckily an aspect that is not glanced over or given second thought, and the visuals in K-ON are something that stand out as being absolutely stellar as a result. Almost everything about the characters is fluid and detailed, with movements looking and feeling very much lifelike. Not only do the mouth and limbs move like in most anime, but the hair will move along with the body, the clothes will furrow and crease realistically to the character’s movements, and their eyebrows and facial shape will accentuate their expression. While the girls seldom practice or play music, the scenes where they do play are beautifully animated and show detail that musicians and general viewers will appreciate. It’s a gorgeous anime to look at and it really reflects the effort that KyoAni put into the series. Music itself is much more varied than in the first season, with several times more unique songs that the girls perform together as a band and during the opening and ending sequences. These songs are all performed by the actors behind each character, and, while they certainly aren't amazing pieces of music, they fit perfectly with the tone of the anime and with the musical talent of the girls. They are not professional musicians but rather highschool girls that play and practice for fun, which makes the silly songs that they perform seem all the more realistic and fitting. Of further note is the background music, which is simplistic and sets the atmosphere for each scene very well. The second season is a bit of a departure from its predecessor, though, in the sense that the music is not highlighted or given nearly as much focus as it had before. This isn't an anime about music but an anime about a group of friends that happen to play music. They practice and play, discuss musical terminology, and shop for new gear, but this serves more as an aspect of their daily lives rather than something they are invariably focusing on and thinking about. There's definitely enough here to satisfy accomplished and aspiring musicians alike, but it is not the focal point. However, when the series does focus on its musical performances it does a fantastic job, hitting on both the entertainment and emotional level. "U & I" is a great example of this, a song written by Yui to show thanks for her sister in a way that she could never express without music. In the end, K-ON is not some form of "masterpiece" or its synonyms. It would be very difficult to find any anime that can genuinely meet that criteria. Rather, K-ON is an exemplary title that showcases what the best of anime really has to offer, both within its genre and universally. It's a title which shows us that a complex plot and deep themes are not required for an anime to truly resonate. K-ON may not be everybody's cup of tea, but for the girls of Sakuragaoka High School, it is their tea party. Well, what else can I really say about this anime, other than calling it a seed of potential that blossomed into a beautiful anime that made me emotionally attached to the story itself as well as connect to my life? Such gems are rare, and im glad i gave this anime a chance to make me laugh, smile and cry without overdoing the "moe moe kyun" factor. Story (8/10): To be fair, people will dispute me, but in K-On! !, the story is something we all live through in our own realities. When watching this Anime, it reminded me of my days in High School, a place where you not only experienced new opportunities, but grew in maturity, and most importantly, developed memories and friendships that would transcend the years themselves. At first, the tone was lulled, but Im not afraid to say that by the end, the way the story developed made me reminisce my final days, and I too got caught in the emotional moments before the end of the Season. I didn't want it to end, but sometimes, thats what makes the best endings, because you know it ended so wonderfully, and that emotionally you were satisfied. Clannad (After-Story), Kanon, Air, Angel Beats! and now K-On!...Kyo-Ani, you have successfully reeled me in again. Art (10/10): Has K-On!! improved since the first season? All you need to do is look at the opening theme songs and compare the artwork. Brighter, crisper, smoother, and especially with the live-action scenes, more atmospheric, my eyes were bedazzled by what Kyo-Ani had done, and one can tell they knew how to get their moneys worth from the animation software. Especially with a certain scene in Episode 10 (I think), It was beautiful. Sound (10/10): Absolutely astounding, thats all I can say. Every time a new song played, whether it was the first few minutes of Episode 1, the new Op of GO! GO! Maniac or Utauyo! Miracle or even something as beautiful as U&I or Tenshi ni Fureta yo, nothing disappointed me, I even laughed a little at the lyrics. I remember disliking Yuis voice initially as well, but oh damn, has it grown on me as time gone on, and even Death Devils songs have revived my love for Japanese speed metal. Either way, the songs make up just another reason why I didn't want this season to end, it reminded me of my days on a Fender Bass or my Grand Piano, the two instruments I consider my life and soul. "Fun things are fun" – Hirasawa Yui. Disclaimer: this is a review of the entire K-On franchise, minor spoilers ahead. Almost everybody, including myself at one time, is so narrow-minded when it comes to cute girls doing cute things in cute ways anime, whether we enjoy them or not, that we don't expect anything else than moe, comedy and fan service. In a result, we don't really pay attention to the real quality of this kind of show. At first, I saw Keion as an extremely entertaining moeblob series, without being able to explain why. In retrospect, I thought that it started out being a decent one, that became fairly good and even somewhat believable in the late second season. After quite a lot of research and thinking, in addition to a rewatch, I realized that Keion actually has a solid narrative, that characterization and character development are more than satisfying, and that the amount of effort put into details is insane. Don't get me wrong, this isn't Disappearance, it's still a fun series with a high iyashikei potential. Dropping this anime after a couple of episodes, simply because you can't see past the moe and think it's going to be another generic school life for male otakus, is a shame. That was to be expected, though, since KyoAni is well-known for animating stuff like Lucky☆Star and The Melancholy of Haruhi Suzumiya. Additionally, the original manga was aimed at the type of person mocked by Welcome to the NHK. Moreover and more importantly, the narrative and character development are pretty subtle: you will miss it if you're not attentive, along with tons of cool details, and think that nothing happened. As Digibro said, "this is a story of how each of these girls finds their place in the Light Music Club". This is the story of their relationship, and ultimately an innocent, adorable and universal story of friendship. Bonus: the second season takes it to a whole new level, but more about that later, I didn't even introduce the characters yet. The first episode opens with Yui, a lazy, carefree, and airheaded girl entering high school. Yui, who literally did nothing in her life, struggles to search for a club to join. This brings us to the energetic and careless drummer of the series: Ritsu, who desires to form a band with her childhood friend Mio, a beautiful, shy, reserved and mature bassist. Tsumugi, a gentle and sweet pianist who comes from a rich background and has always dreamed of experiencing a normal rose-colored school life, quickly decides to join their band: the Light Music Club. Later on in the series, the serious guitarist Asuza is struck by the performance of these girls at freshman welcoming ceremony, but doesn't understand their appeal, and ultimately joins it as well. I'll say it again, dropping this anime after a couple of episodes is a shame. At the end of the first one, it's perfectly understandable if you're skeptical about this show and don't know why you should stick with K-On!, neither Yui knows what to do. She doesn't know what the Light Music Club, "K-On" in Japanese, really is about, nor whether she should join it either. While not being astonishing, the beginning makes sense in term of narrative, and Yui could be considered at some level as a metaphor of the viewer, which is pretty nice. There is no such thing as cheap and easy way to portray inner thoughts, dilemmas, and emotions in this series. For instance, Yui won't say out of nowhere "Damn, I just realized that I was being egoist and didn't take guitar seriously, I feel bad for other members." with a melodramatic song. It was never stated by any characters: it's up to the audience to understand it. To be honest with you, getting a glimpse of her feelings through her reactions, tones, body language, etc. isn't hard... as long as you're paying attention. I love how this anime is full of this kind of details and subtleties that nobody in the show points out. If you have already watched the first season and think badly of it, you might be wondering "what are you talking about, characters are generic and not developed at all, plus Yui is autistic". Then as you have already guessed, I'll tell you that you missed lots of meaningful details and subtleties... even though that you aren't completely wrong. This season mostly sets up the characters, their club, and the world they live in. In short, you get the basis of what Keion is. And sadly enough, it's rushed as hell. In point of fact, K-On! focuses way more on establishing the setting and on the comedy, than on this franchise's biggest asset: the characters. Their characterization is pretty weak and they hardly ever feel human. At the end of the 13rd episode, while they definitely have changed a little, you won't notice huge differences in their simplistic and moe personality. It's easy yet important to understand how much they love each other and feel comfortable in the Light Music Club, though. The humor is another problem, by frequently feeling cheap and forced ("Moe Moe Kyun~"). As for Yui being an airhead autistic savant, it's notably used to show us how incredibly she can get serious for her friends, and of course as a joke. The second season improves upon like, everything. From characterization to lighting to animation to direction to comedy to activities. The animation is more lifelike and detailed than ever, colors feel more natural and refined, backgrounds are more realistic, and on and on. While the first season covered two years in only 13 episodes, the second, completed by an OVA plus a movie, benefits from 26 episodes to follow the senior year of Yui, Ritsu, Mio, and Tsumugi. This slow, realistic pace allows to characters way more time to interact naturally with each other, and grow up as people. That's considerable, since while the setting set by the first season was perfectly believable, thanks to the amazing work of Kyoto Animation, characters weren't yet. Visuals put aside, what really struck me in at the beginning of K-On!! were the changes in nature of humor. This season isn't entertaining solely because of the moe anymore (even though its predecessor had its moments as well), it's amusing because the comedy which involves and relies on cute girls, with their colorful and distinct personality, is genuinely funny. Moe definitely has become an integral part of their characterization, but at the same time, jokes are more mature and sophisticated. For instance, Yui wouldn't have commented on Sawa-chan's love life with a mean undertone in K-On!. It might sound silly, but I think that lots of comedy scenes could only work in this series with these particular characters. If I had to describe K-On!! in one word, other than "fun", it would be "healing" (then "immersive", and last but not least "creative"). The comedy in Keion has never intended to be over-the-top, nor it should have. Indeed, quite a lot of moments don't aim at making you laugh, KyoAni doesn't force the girls to go out of their personality to make hilarious things happen. While being both, seeing these friends interact with each others and react with various believable situations is often more heartwarming than amusing. You're more likely to find you smiling during the span of an episode and have a good laugh now and then, than dying laughing every minute. Some could argue that Non Non Biyori is better as a relaxing anime, but that would be overlooking the fact that iyashikei is just a part of what makes K-On!! stand out from other moeblob anime. While Asuza could almost be merely defined by "moe" at the end of the first season, which left little to no room for character development, she becomes much more human and is given more depth in the second one, at the same time as Yui and the others. The episode where she wonders to what extent her friends influence her, and whether she's still herself, is especially interesting, her relationship with Yui being the key of her development. Being the only underclassman of the Light Music Club, Asuza is going to be left alone by the time the seniors graduate. For the viewers, this season may be all about the dynamic between the characters, but for our lovely girls, this is all about accepting reality and growing up. During the first half of K-On! !, they're too busy to enjoy themselves and making the most of their youth to be concerned about this fact, though. As mentioned before, this season focuses heavily on these five girls interacting with each others. Everyone has experienced a couple of things of what the characters live in the show, from sleeping with friends to studying to graduation. By portraying it in such a realistic yet slightly romanticized and funny way, Keion speaks directly to the heart of viewers. All of these natural interactions and subtle reactions create a deep sense of immersion and ultimately lead to their development. In real life, people rarely do a 180° in personality from one day to another. They gradually change, grow, evolve. Do not expect a character development like Simon's from Tengen Toppa Gurren Lagann, but rather few subtle, believable and logical changes in their personality all along the show. Being the pivot in the dramatic progression, Azusa's development is quite special, her attachment to the club and especially toward its members continually growing as graduation is approaching. Speaking of, even though the story ends up mainly resolving around Azusa, the other keion girls have lots of opportunities to grow out of their moe archetypes as well. In a result of being a part of the Light Music Club, even the character with the weakest and most overlooked development, Tsumugi, gradually becomes much more proactive and involved in the life of the club than before. Azusa's personality, development, and conflicted feelings are explored through her interactions with her friends, as well as the other girls, together with few sweet scenes of introspection. All of that naturally leads us to the episode twenty, both climax and payoff of season 2. This episode shows us their last school festival performance, then finally the girls intimately realizing how much they loved their time together, and about graduation. The more you connect and become attached to the characters, the more the episode twenty will resonate with you and might become one of your favorite episode of all time (alongside the last battle of Gurren Lagann and the end of The Tatamy Galaxy for my part). Even if you don't care much about these characters, you can still enjoy this episode from a narrative standpoint and for its masterful execution. Along with a stunning animation and great accurate playing, you get a near-to-perfect artistic direction, an amazing sound design, and awesome insert songs. The best part is how Kyoto Animation utilized all of these elements in harmony to create some of the most powerful, emotional, heartbreaking and beautiful scenes I have ever seen, across all mediums. Though a little personal bias might have affected my judgment. I'll say no more but one word about this episode: "lycopene~". Episode 24, the last one chronologically, and the second climax of the series, made me tear up as well. But again, it is not forced and tearjerking like Jun Maeda's shows (e.g. "please cry now it's supposed to be a sad scene" with overblown sad piano and sad violin). These two episodes couldn't have had such an impact on me if this franchise wasn't as I described above. The final arc, with its melancholic atmosphere and tone, is the most logical way to conclude the story given what came before, and thus is the ultimate proof that Keion's narrative makes sense and follows a logical progression. It's really important to understand that these episodes don't come out of nowhere. They're so great because of the solid and believable foregoing. To speak only of the graduation, lots of shows make clear of their characters' emotions prematurely ("oh my god it's our last year together I'll miss you so much... is that sad piano am I hearing? Let's cry!"). In real life, just like in Keion, people tend to put off this kind of problem and emotions until they no longer can. Not to mention they don't randomly force themselves to talk about it for the pure sake of drama. Something Keion does better than most of the shows I've seen, is creating a believable world, a world that feels alive, a world that works on its own. I won't put it on the same level as Cowboy Bebop's world building, but it's still nice to Yui's classmates acting like real people for example. It might feel a little contrived how much everyone cheer for the Light Music Club, though. It's worth mentioning that some recurring side characters, like Yui's sister, Azusa's friend Jun, or Sawa-chan-sensei, are given quite a lot of screentime and a proper treatment. KyoAni's attention to such details helps to build the consistent world I love. Additionally, in a result of depicting the daily life of the keion girls with Naoko Yamada's style, this anime is extremely immersive and atmospheric. The complete lack of fanservice contributes significantly to maintaining the suspension of disbelief. While both seasons indeed have scenes with the girls in cute bikini and having reflexions about Mio's or Azusa's chest, they don't exist solely to please the male audience, they're genuinely immersive. You could totally imagine real teenagers wearing this kind of swimsuit and making such friendly mean comments (the few ones in the second season aren't even necessarily explicit, you know, just like in real life). Characters are not sexualized in the least, and the only things that could be considered as cheap fanservice, in its wider meaning, are silly "moe moe kyun" jokes from the first season, and Sawa-chan's passion for cute outfits. It's actually quite funny to see the girls' skirts to systematically fall between their legs when they sit down. This is moe at its purest form. That's just how much KyoAni's staff love their work and respect its characters. One doesn't have to be an anime veteran to understand the complaints about the lack of creativity of studios when it comes to moe. While Keion doesn't stand out that much in this area, we still should give KyoAni some credit, which definitely get out of their comfort zone in the second season, by not always following the same recipe and trying to keep renewing themselves. Regarding openings, even though I tend to prefer Go! Go! Maniac! to Utauyo!! MIRACLE musically speaking, the last one is really emblematic of what the show has to offer in term of fun and creativity. The latter adjective applies to the legitimately awesome endings as well: Don't say "lazy" (the most memorable), Listen! (my favorite), No, Thank You! (the best). Don't forget Keion is, for the most part, a show about cute girls doing dumb stuff. I am obviously not saying crap like "at the end it's still just a moeblob anime, it cannot possibly be good". My aim here is simply to bring to light what this series intended to do and how great the execution is. Being bored by all of these silly characters and lazy afternoons is perfectly understandable, and not the end of the world. Keion may simply not be for you, but hey, there are tons of great shows out of here, just try to keep an open mind. Just a few words about both OVAs and movie, even though the latter definitely deserves a review on its own. The first OVA takes place after the events of the first season, on the New Year's Eve, and could belong to the second one, with the girls stepping outside of their club and the fun mainly coming from their natural interactions. The second mostly prepares the ground for the movie. Despite being a great condensed version of the second season with truly excelling production values, K-On! Movie is still slightly inferior to the series, in my opinion, the whole being greater than the sum of its parts. Things are sometimes more than they seem, but at the end, fun things are fun.